Kiko Kostadinov’s workload increased recently. The 27-year-old menswear designer was enlisted to be the creative director of 200-year-old brand Mackintosh; a world-renowned outerwear brand sold in almost every retailer under the sun. It’s a massive confidence boost to the already-lauded Kostadinov whose eponymous label has skyrocketed to mainstream menswear headlines. His namesake’s Spring 2018 collection was no less brilliant despite the appointment. “Evil has become entertainment,” read the press notes. Brexit, the ensuing political and social downfall, Donald Trump and the endless engendering of controversy in America—political discourse was reshaped in 2016 and not exactly for the better, and 2017 appears to follow on in a similar way. Not a day goes by without reading a heinous headline that inspires only sadness and disgust. (The lack of government intervention in the aftermath of recent atrocities at Grenfell Tower spring to mind.) It appears we live in a surreal world and Kostadinov reflected that in this show with a nightmarishly grim vision, executed with high technical skill. His soundtrack was punctuated by the soundscape of David Lynch’s 1997 film Lost Highway, a tale of two intersecting stories about a man accused of murder and a man embroiled in an affair with a cheating temptress. The fictional character, serial killer Francis Dolarhyde—specifically his appearance in the 1986 film Manhunter—imposed an idea of duality within the collection. Good vs evil—one of the most recognisable narrative tropes in history—played out before our eyes. It was infectiously macabre with sharp tailoring and an unnerving colour palette, comprised of oxblood, chartreuse and pewter. Furthermore, the models were styled with stockings covering half of their faces, a terrifying mask of sorts and their lips were stained in a plum hue. 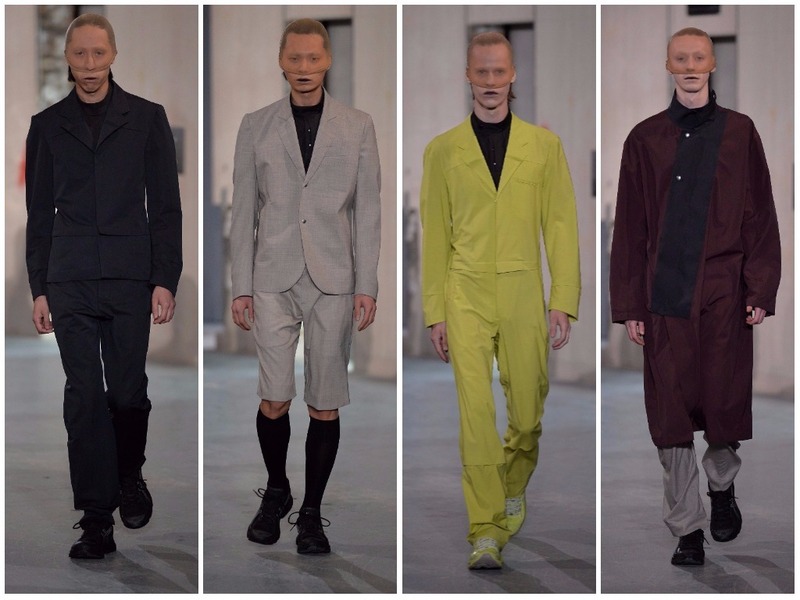 Kostadinov’s signifier is his affinity for utilitarian garments. Despite the twisted source material, he revels in the technical aspect of design. This season the tailoring is constructed with an emphasis on the exterior: bone-like darting, shirt collars rising up to the throat forensic boiler suits with extra layers. If the intention was to imbue the show with moderately disturbing points of interest, he was auspicious in his endeavours. This was sinister fashion, a “surreal drama of murderous transgression”. It was bleakly cynical and delectably perverse—badness has never looked so good.